A person has two basic parts. The noble savage is the human part of us that walks the Earth during a carnal lifetime. 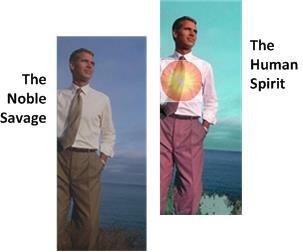 The spirit is the finer part of us that lives on after we die. Noble Savage World explores the noble side of us humans that spreads light, peace and order by resonating with finer spirit… and our savage side that spreads darkness, conflict and chaos. This is the site you’re currently on. An insider’s view of ITC (instrumental transcommunication, the use of technology to get in touch with the spirit worlds). From both websites it’s my hope that you’ll emerge with a better understanding of our world and our place in the grander scheme of the cosmos.